The State Legislature passed a transportation budget. Here’s what that means for a biking project near you. 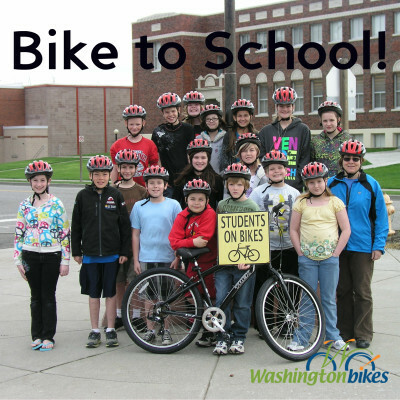 Last week, the state legislature passed the 2015-17 biennial transportation budget with approximately $21 million for biking, walking, and safe routes to school projects, or .055% of the $3.8 billion in capital project expenditures. While an incredibly small part of the state’s transportation budget, these projects are often big priorities in communities statewide. So did your biking project get funded? The next state budget helps some, but leaves over 80 projects on the table that could help get more kids safely biking to school. Out of approximately $111 million in statewide project requests, last week the Washington State Legislature approved an assortment of funding sources to invest $21 million, or less than 19% of the total requests made by cities, towns and agencies statewide. For the Bicycle and Pedestrian Grant Program, $8 million in state dollars will make 24 projects go to either design or construction for trails, safer crossings, or other critical improvements. In addition, the State Grant Program funds a 2-year effort spearheaded by Washington Bikes to establish a network of up to 50 permanent bicycle counters in jurisdictions statewide. Here’s the list of those funded biking and walking projects. 83 other biking and walking projects were not funded. For a list of those unfunded projects, go here. The continually popular Safe Routes to School Grant Program will tentatively receive a little over $13 million. Still, its funding remains slightly uncertain as approximately $7.2 million comes from federal funding sources stuck in limbo as US Congress debates the future funding structure and priorities of a new transportation reauthorization at the federal level. Assuming for the best, 28 projects and programs will improve safety and provide more opportunities for physical activity in places like White Salmon, Ocean Shores, Wapato, Lake Stevens, Spokane, and Wenatchee. 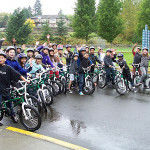 For a complete list of funded Safe Routes to School projects, go here. Additionally, 61 other projects and programs to connect children to their schools will go unfunded in the 2015-17 biennium. 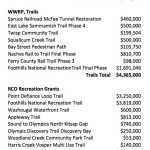 Still, the Washington State Legislature and Governor Inslee have an opportunity in June to invest in many of these currently unfunded projects by passing a balanced and multimodal transportation funding package that prioritizes safety and physical activity, particularly for our state’s children. 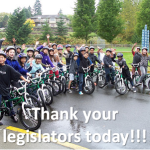 Take 20 seconds today to write your state legislators to ask them to fund biking safety at or above the levels proposed by the House Transportation Committee chair. This article was posted in Advocacy, Federal, Funding/Policy, Infrastructure, Issues & Advocacy, News, Politics, Safe Routes to School, Safety, Transportation. Bookmark the permalink. Follow comments with the RSS feed for this post. Both comments and trackbacks are closed.